GreenEarth Landscape Services is committed to“Exceeding Your Expectations,” and who better to attest to our commitment to our clients, as well as expertise in delivering professionalism and the best service possible, than our clients themselves! After trying to get grass seed to grow in our front yard last summer my husband and I decided this spring we wanted to sod our front yard. We wanted our daughter to have a nice place to play outside this summer. 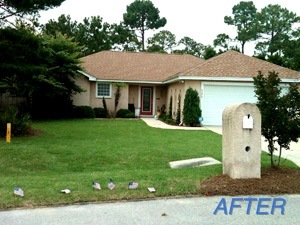 Green Earth Landscape Services has performed our landscape maintenance and installation since our apartment community was built in 2007. Although we accept proposals annually from other landscape companies, Green Earth has been awarded the contract for the last four years. Their professional approach, well trained staff and proactive philosophy have been the deciding factor every year. Their regularly scheduled property inspections and continuous communication make our job easier and our property beautiful. 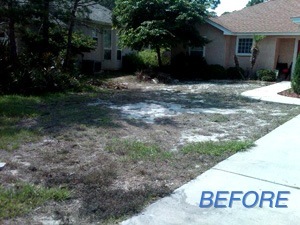 I would recommend Green Earth to anyone wanting to improve their landscaping or maintain excellent curb appeal. – Kim D.
As the president of the Harbour Village Homeowners’ Association I would like to express my appreciation for your company’s efforts over the past 5 years. When the property was turned over to us by the developer you took over the responsibility to care for a unique park that is actually the roof of our garage. That necessitated the development of new techniques for everything from how to irrigate, mow, and even how to fertilize since we only have a thin surface of soil over the highly engineered drainage substrate covering the concrete garage roof. Your creating those new techniques, and your constant diligence has turned those shrunken individual squares of sod into a show place more like a golf course than a lawn. We have a new construction house and were in need of landscaping; both a plan and execution. Our lot was low and was crowded with scrub hrush, tree roots and organic dehris. After working with Shannon on a plan, the work began. He incorporated low maintenance gardens, a play area for our grandchildren and keeping as many trees as possible. It was exciting to see the yard take shape; in keeping with the architecture of the house. Even though it is winter, we have interest, contrast and beauty. The team introduced new plants and kept a park-like feeling throughout the property. Shannon also worked with us as we wanted a spray-free environment which has attracted butterflies and birds. We can’t wait until spring!